Primary School English Medium Teachers Training in Divisional level Dates, Guidelines : Conduct of divisional level orientation Programme to the teachers of English medium primary schools (7461) in non-residential,Guidelines,Time table, Districtwise observes, SRPs List ,Budject,Rc.254 Proc Re. No. 254/B/SCERT/2018, Dated: 14.11.2018 Sub:- SCERT - Amaravathi - Conduct of divisional level orientation Programme to the teachers of English medium primary schools in non-residential - certain guide lines issued - Reg. 2. Instructions of the Commissioner of School Education. All the DEOs in the State are informed that the Government of Andhra Pradesh has introduced parallel English medium sections in 7461 primary schools. In order to develop required proficiency in teaching all the subjects in English medium effectively, the Department of school education has prepared an informative hand book titled KNOW-HOW and already organized a 5 day TOT for both SRPs and DRPs by SCERT successfully. The division level training Programme should be conducted as a 5 day non-residential Programme from 9.00 AM to 5:00 PM. and Two Spells in Divisional level. 1. One teacher from each English medium primary school, dealing I class, should be identified and deputed by the District Educational Officer to attend the above said programme. 3. Each Class room should not exceed 50 teacher participants. 4. The entire training programme should be completed in one spell and for Kumool in 2 spells according to the dates mentioned below. 5. The DEO should allot a team of 3 to 4 DRPs to each division to act as Resource persons. 7. Make use of the services of SRPs those who are drafted to respective districts. 8. MEOs of the concerned division headquarter will act as venue coordinators and DyEO of the concerned division has to monitor training programme. SSA will be the course coordinator. 10. A planning meeting should be conducted involving DYEOs, MEOs, AMO, SRPs, DRPs on or before 27.11.2018 to finalize all modalities of the programme. training programme) and they should incur the budget as per the unit cost communicated here with without any deviation. 16 The hand books" Know - How" should be given to the RP s in the beginning of the training and to the trainees on the final day. The acknowledgement of those books should be sent to the Director, SCERT along with all other relevant Annexures. 17 All the district educational officers are requested to arrange biometric machines in all the venues and take the attendance twice a day i.e 9:00 AM and 5.00 PM. 18 Day wise attendance particulars should be submitted to this office. 19 District educational officers and project officers of SSA should visit and monitor the training programme regularly. 23.11.2018 to this office (SCERT). 23 The DEO should provide basic medical first aid kit at each venue. 02-12-2018 and for 211d spell pre-test on 03-12-2018 and post-test on 07-12-2018 and should be valued by the resource persons. The comparative statements should be analyzed by the SRPs & DRPs in the training and the same to be furnished to the Director, SCERT. date of completion of training programme. Kumari, Contact No: 9866117097, Email: rajanigangolu@gmail.com, Coordinator of this programme at SCERT, Amaravathi. 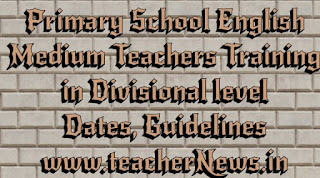 Primary School English Medium Teachers Training in Divisional level Dates, Guidelines Download. 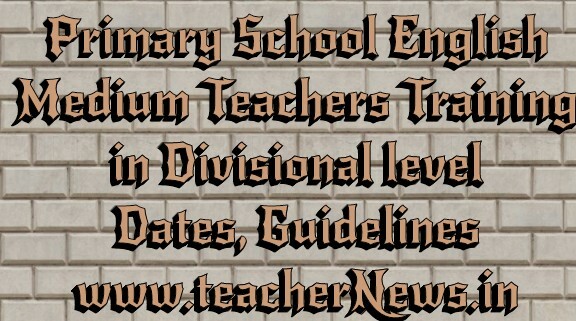 English Medium Teachers 5 days Non ResidentialOrientation training from Dec 2018 Time Table and Guidelines Download.